Investing is more than throwing together mutual funds and seeing what sticks. Asset allocation – deciding at a high level what types of assets to own – is the most important decision you make as an investor. The right structure can lead to long-term success if it is built on a foundation grounded in investment theory and is supported by evidence. That structure starts with the global market portfolio. The framework for the market portfolio was first introduced by Nobel laureate Harry Markowitz in 1952. He argued that investors care solely about finding the highest returning portfolio for a certain amount of risk. Among all possible portfolios, there is one with the highest return per unit of risk – the most efficient portfolio of risky assets. Others extended the theory to say if all investors seek efficient investment strategies, then investors will ultimately want to own the one portfolio that best balances risk and reward. Each investor can then decide how much of this portfolio to own to calibrate his or her desired amount of risk. 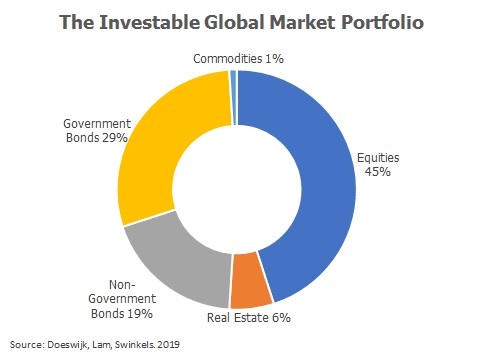 As it turns out, that singular portfolio of risky assets is the global market portfolio where all assets are held in proportion to their market values. It represents the average investor’s portfolio, and the market’s view of the tradeoff between risk and return of all financial assets. It feels like financial wizardry to say the market knows something the individuals do not, but the theory says there is wisdom in the crowd. Each individual investor may make mistakes, but collectively, the market will get it right. So, what does the average portfolio look like? The global market portfolio is 45% stocks. Of those stocks, they are split approximately 50/50 between US and non-US stocks. Another 48% are global bonds, comprised of government and non-government debt. The remaining 7% is invested in investable real estate securities and commodities. This theory is, of course, not perfect. But it is good enough to serve as a baseline, as it theoretically balances risk and reward most efficiently. It is how some of the largest investors in the world aim to invest. For all its imperfections, this global market portfolio has a strong track record to support its case. Between 1960 and 2017, the global market portfolio returned 8.4% per year with a maximum peak-to-trough drawdown of 35%, and a Sharpe ratio of 0.36 (a measure of return per unit of risk). That is a high bar for any other strategy. For comparison, the S&P 500, a top performing segment of the stock market, returned 10% over the same period, with a maximum drawdown of over 55% and a Sharpe ratio of 0.33. The global market portfolio achieved a better risk-adjusted return with only two-thirds of the drawdown and only 45% allocated to stocks. That speaks volumes to the benefits of diversification and the collective power of investors to allocate capital efficiently. Does this deviation improve the odds of achieving my financial goals? Does it bring the risks more in line with my goals? Will this help me stick to my investment strategy? Does it improve the tax efficiency of my portfolio? If an investment strategy or product fails to provide a solution to one or more of these questions, then it shouldn’t have a role in your portfolio. The message here is powerful: a globally diversified portfolio is worth sticking to. It does not suggest this portfolio will be the highest returning, offer a panacea of steady returns, or will never slump. Part of having the faith to stick through the tough times is knowing your portfolio is built on a well-grounded strategy. While your personal situations will dictate your portfolio, evaluating the global market portfolio should be an important consideration in your investment process.